Ideal for smaller bedrooms or a closet, this six drawer chest has plenty of room to store most of your folded laundry. 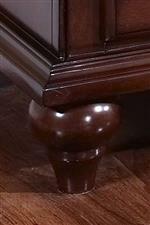 Moulding at the top and bottom of the piece, as well as turned feet provide traditional style to the piece. Side mounted glides make the drawers easy to use and help them move smoothly. The Spring Creek Six Drawer Chest with Metal Drawer Knobs by New Classic at Casa Leaders Inc. in the Wilmington, Long Beach, Torrance, Lakewood, Los Angeles area. Product availability may vary. Contact us for the most current availability on this product.